The MCMUA helps business and institutions with a variety of services and solutions. As a business, use this page to find answers to common issues impacting businesses. Recycling Mandates and Laws - Source separation recycling for designated materials is mandated by law for all businesses and institutions in Morris County. The MCMUA may be able to provide recycling collection service for businesses located along its residential collection routes. 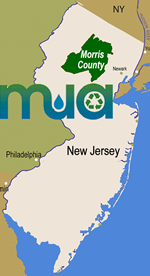 The MCMUA also provides recycling collection in select business districts such as in Morristown and Denville. We are excited to offer single-stream recycling collection, which makes compliance with source separation mandates comprehensive and easy. Contact us to see how we can help improve your business recycling program. While construction and demolition debris (waste type 13C) is not mandated to be recycled in Morris County and can be disposed of at the MCMUA transfer stations, much of it is potentially recyclable and many recycling facilities accept and recycle it. To be compliant with Morris County waste flow control requirements, these recyclable materials must be separated from other garbage on site prior to being transported to a recycling facility. In addition, the remaining garbage must be disposed of at the MCMUA transfer stations. The MCMUA has not entered into any agreements with any materials recovery facilities allowing them to assume responsibility for these waste generator's obligation of separating recyclables from garbage. Sending mixed recyclables and garbage to a processing facility to have recyclables separated from the garbage for you is likely to violate laws and regulations related to source separation recycling and waste flow control mandates. Please recycle properly to avoid being non-compliant. While a great deal of construction material is packed in corrugated cardboard, corrugated cardboard is mandated to be source separated and recycled in Morris County and cannot be mixed with construction and demolition debris being disposed of. It usually does not make sense to only have one dumpster at a construction/demolition site since it will be necessary to put certain materials into the garbage and recycle others. Mandated recyclables cannot be mixed with garbage for disposal. Recycling Activities and Notification of Exemption form New Jersey Department of Environmental Protection (NJDEP) Permitting - The NJDEP has established an exemption notification system that allows limited business recycling activities to occur without requiring the business to obtain an NJDEP permit or general approval. As long as the recycling activity of the business stays within the limitations of the exemption, which includes compliance with all other laws and regulations, the recycling activity is allowed to occur. Many of these recycling activities impact landscapers and contractors and the management of job debris. Click here for more information about recycling facility exemptions.